A common problem cropping up in discussions of oil additives is the use of incorrect dosing amounts, usually due to a misunderstanding of how dilutions and resulting concentrations are calculated. In chemical formulation (unlike cooking) the quantity of a specific atom or molecule determines its characteristics when combined with other chemicals. Since the weight of a single atom or molecule is a known quantity, we measure bulk amounts of chemicals by weight. When calculating the concentration of various atomic or molecular constituents in a mixture, we are looking for that particular element or molecule’s weight as a fraction or percentage of total mixture weight. If volumes are used instead of weights, measurement or dosing errors will often occur. The difference is most substances differ in density from each other; therefore similar volumes of these substances will have different weights. In order to correctly calculate weight fractions from a mixture of substances of differing densities or atomic weights, density or atomic mass of each constituent must be factored into the calculation. In the case of determining relative amounts of chemicals such as the phosphorus in an oil additive, we must factor the relative density of the additive separately to that of the oil. Various grades of motor oil have a density of between .82 and .88 grams per cm3, depending on viscosity and additive package. 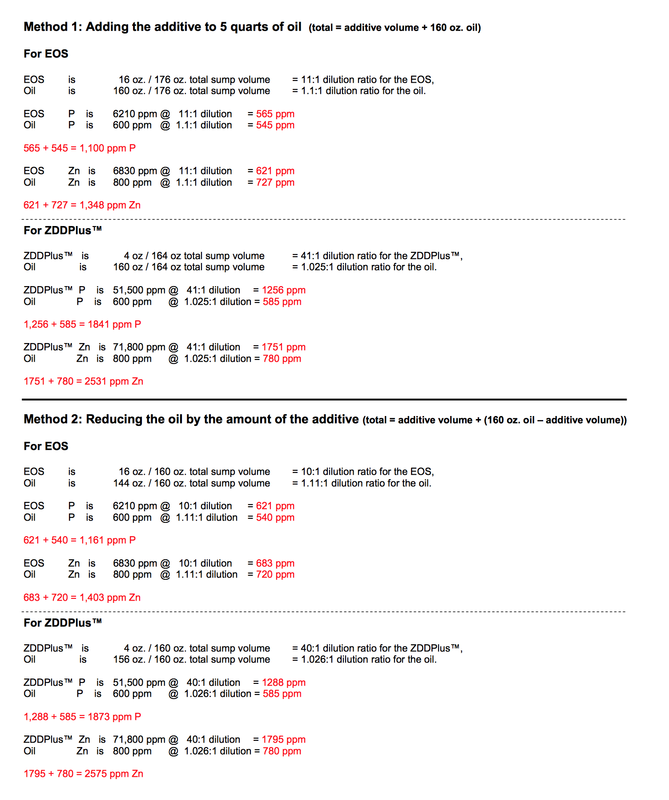 0.86 grams per cm3 is an average value we use when calculating oil additive dilutions that we arrived at after measuring many different 10W-30 motor oils. For the density of ZDDPlusTM we use the average value of 0.99 grams per cm3. For the density of EOS we measured 0.91 grams per cm3. Once density has been factored in, we can use straight volumes for dilutions. Directly measuring the amount of ZDDP in an additive is extremely difficult due to the mixture of different alcohols used in its manufacture, and the resulting range of atomic weights of the ZDDP molecules. The most common way to indirectly measure the ZDDP content is to use one of several ASTM test methods to measure the phosphorus and zinc content. Zinc can often be added to oils as an acid neutralizing agent, so zinc is not a reliable indicator of ZDDP. Since phosphorus is found in oils predominantly in the form of ZDDP, we use it as the measurement criteria for ZDDP. If you are using a phosphorus test result as an indicator, the correct way to state ZDDP level is to state an amount of ZDDP that results in a certain phosphorus level. Phosphorus is also the element identified as most potentially compromising to the catalytic converter, so there is a maximum 800 ppm or 0.08% phosphorus level specified in the SM oil classification. SF oil was in common use back in the time of older high-performance cars with flat tappets and higher than current valve-spring pressures. The best heavy-duty oils of that time contained a level of ZDDP which resulted in a phosphorus level measured in the range of 1200 to 1600 ppm. Recent testing of modern SM oils reveals that many contain around 600 ppm of phosphorus. Therefore, to accurately estimate the total amount of phosphorus in the final oil, we add this 600 ppm to the amounts due to the additives. Once we have figured out the phosphorus level, zinc can be calculated in the same manner if desired. The preceding calculations for the 5-quart oil changes give typical results when used in many classic American V8 engines. The target 1800 to 2000 ppm range for phosphorus is designed to give the longest possible anti-wear agent service with no risk of overdosing. Based on the 0.94:1 ratio of phosphorus to zinc in the ZDDP molecule itself, this range of phosphorus would give a zinc level of about 1900 to 2100 ppm. As you can see from the ZDDPlusTM calculations, the zinc level when targeting the 1800-2000 ppm phosphorus mark falls in the 2400-2500 ppm range. This extra zinc is due to good over-compounding with zinc oxide during the ZDDP manufacture. This extra zinc in the form of zinc oxide helps give a high TBN (total base number) for excellent long-term acid neutralization. 10% higher Zn for EOS: 1483 ppm for 4 quart vs. 1348 ppm for 5 quart. 15% higher P for ZDDPlusTM: 2117 ppm for 4 quart vs. 1841 ppm for 5 quart. 15% higher Zn for ZDDPlusTM: 2911 ppm for 4 quart vs. 2531 ppm for 5 quart. We believe dosing a 4-quart oil change with one 4 oz bottle of ZDDPlusTM is safe. If you feel you would rather have your 4-quart oil change phosphorus or zinc concentrations closer to that shown above for 5 quarts, then merely use 3⁄4 of a single bottle (3 oz) in an oil change. If the top is replaced snugly, ZDDPlusTM will be usable in the next change, when added to 1⁄2 (2 oz) of a 4 oz bottle to equal the 3 oz dose. 8% lower P for EOS: 1012 ppm for 6 quart vs. 1100 ppm for 5 quart. 7% lower Zn for EOS: 1254 ppm for 6 quart vs. 1348 ppm for 5 quart. 12% lower P for ZDDPlusTM: 1620 ppm for 6 quart vs. 1841 ppm for 5 quart. 12% lower Zn for ZDDPlusTM: 2227 ppm for 6 quart vs. 2531 ppm for 5 quart. The approximate 12% drop in P and Zn when using one 4 oz bottle of ZDDPlusTM in a 6-quart oil change is negligible, and will give anti-wear protection for the cam and lifters of engines with even the highest spring-pressures. Referring to the results above using either method for a 5-quart oil fill, the addition of one 16 oz bottle of EOS would get you half way to an optimum level for a classic high-performance car, but carries with it 16 oz of oil different from the oil you add it to. However, one 4 oz bottle of ZDDPlusTM gives the proper amount with a comfortable safety margin, and you choose all but 4 oz of the oil’s characteristics with your favorite oil. If you factor in normal depletion rates, then only ZDDPlusTM has the potential to maintain adequate protection for the duration of a 3000+ mile oil change.